Join us each and every Tuesday at 6:00 pm for a fun filled class designed to show you just how easy it is to learn how to Ballroom and Latin Dance. Sarah is a former student turned Pro and is sure to help you find your inner dancer. She will take you through the basics for the Foxtrot, Waltz, Rumba, and Swing! John is the perfect instructor to help you ease into Ballroom and Latin dancing. He has years of experience of helping couples prepare to dance for their wedding and now he is helping others learn how to Ballroom and Latin Dance. He makes learning fun and easy. 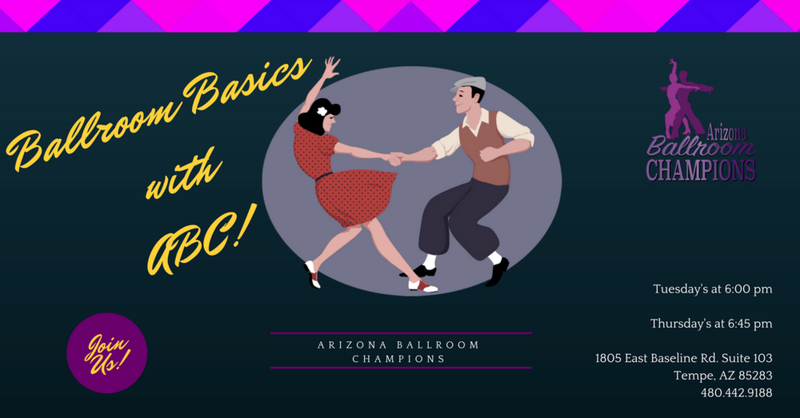 Join us and learn the basics to the Waltz, Foxtrot, Rumba, and Swing!